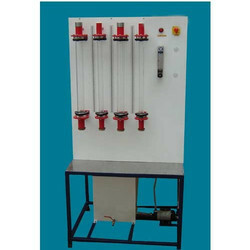 Pioneers in the industry, we offer flow through fluidized bed apparatus from India. Floor Area 0.75 m x 0.75 m.
Electricity 500 watts, 220 V, 1 Phase. We are offering a wide range of Flow Through Fluidized Bed. To study the relationship between the velocity of fluid and pressure drop per unit length. Looking for “MOMENTUM TRANSFER LAB”?